Home Beers The All American Beer Company. American Patriot | The All American Beer Company. The All American Beer Company. Clear golden color, 1/2" head that quickly dissipates. Little retention, doesn't renew with a swirl well. Clean, floral, grassy scent right after pouring, surprisingly nice. As it warms though these notes quickly fade and give way to more of a sweet, wort-like aroma. The taste is not as promising as the smell. No hop presence, tastes like watered down corn syrup. I think this is supposed to be all malt so I'd have to assume the corn taste is DMS presence. Overbearing malt sweetness, very unbalanced. Makes it kind of heavy. Light bodied but kind of sticky & syrupy. Low carbonation, almost none. Lingers unpleasantly for a bit but not too long. This is not the type of experience I like in a lager. Too sweet and corny, sticky, almost tastes like wort. Under-carbonated, under-attenuated, and either too much corn adjunct or too much DMS. I'd honestly take a Bud Light over this any day. "Brewed in America using only the finest hops and grains." Nothing more American than an AAL, I suppose? A: Pale golden. Shade darker than one of the light macro beers. Half finger white head. Retention is pretty minimal. Vigorous carbonation. Looks like most other AAL's. S: Cream corn. Metallic. Very mild hoppiness. Some fruit coming off, mainly apple. Smells pretty rough, to be honest. T: Initial surge of corn sweetness. Mid palate balances out, bring more of the barley into play. Hops are minimal. Bit of floral, metallic spiciness on the end underneath a decent amount of adjuncts. M: Mildly creamy. Carbonation is present, but is more subdued than one would imagine. Fairly dry, but has a definite grit on the finish. O: Pretty piss poor. Obviously taking a shot at AB InBev. About the same quality. Hell, I think I give Budweiser a slight edge in flavor. This beer does not bring out the patriot in me. While it's all well and good that it's American made, it's not even made in St. Louis, the town smeared across the label. The fine print lets your know that it's actually brewed in LaCrosse, WI. Corporate misdirection? Now that's American. Will not buy again and urge others not to do the same. 12oz bottle. Poured out a pale, straw-yellow color with a small, fizzy, white head of foam. It smelled of corn and other grains. Bland but oddly sweet. This bottled brew appears to be contract brewed by some operation in Lacrosse, Wisconsin even though this company is based in the St. Louis area. It pours cold into my glass with a very light yellowish appearance, a bit anemic looking but energetic with carbonation and a fair white head that dissipates pretty quickly. No lacing follows. I get a lot of corn/Karo syrup in the aroma. Seems fairly strong to me, very much an adjunct sort of deal I'd say but the cereal grain idea is there, it's just sort of unappealing, heavy and sweet. The flavor follows suit with a thin grain sweetness that come off as corn-rice cotton candy. Grainy but not balanced at all and just sort of dead weight for a very macro brew concoction, and not as good as the big boys do it. The body is generally light though the carbonation flattens out quickly to a somewhat lifeless feel, just a touch of fizz and that deadweight sensation. It leaves a sugar high backlash and overall does not invite a revisit. It's drinkable but make sure you ice it down heavily! Drinkability- It's ok but I wouldn't buy it again unless it was really cheap. A cold one isn't that bad on a hot day. 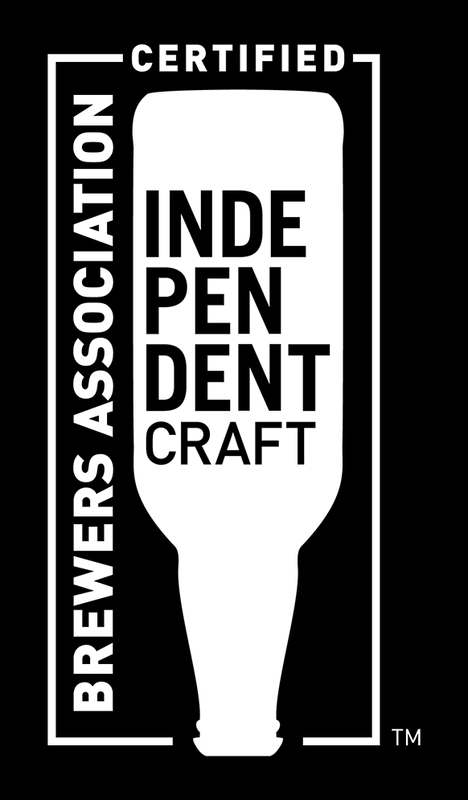 Pours a clear gold with a foamy beige head that settles to wisps of film on top of the beer. Small patches of lace slowly drip into the remaining beer on the drink down. Smell is of malt, grain, sugar, and slight fruity aromas. Taste is much the same with sweet grain, corn flake, and slight fruity flavors on the finish. There is a very mild amount of hop bitterness on the palate with each sip. This beer has a good level of carbonation with a crisp mouthfeel. Overall, this is a pretty awful beer that seems almost exactly the same as the Light version in terms of the aromas and flavors I am getting. I purchased a bottle of American Patriot for $0.79 in Highland Park, CA. American Patriot has an almost flat body with almost zero carbonation. 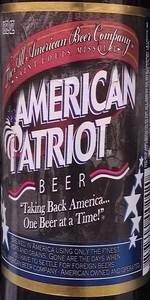 American Patriot has the flavour of a kvass mixed with rusty metal. American Patriot has an aroma of rusty metal. People who enjoy the taste of rusty metal mixed with kvass and sugar will enjoy American Patriot. I am the person who posted the American Patriot photo. Appearance: Muddled copper with a quickly disappearing head and slight lacing. Lots of carbonation. Smell: Creamed corn, grass, malt, a hint of hops. Taste: Creamed corn, grass, malt. Mouthfeel: Creamy and medium bodied. The Verdict: Meh. The label says “Taking America back one beer at a time.” At this rate, they’re losing one beer at a time. The company brags about taking on the big boys at InBev, but they should at least come up with something that tastes better than Bud. Smells like farts. Tastes like metal. Bought a pitcher for $6.50 in New York City though so I'd drink it again for that cheap. American Patriot from The All American Beer Company.